The avocado is a rather unique type of fruit. The most fruit consists primarily of carbohydrate, while avocado is high in healthy fats. Numerous studies show that it has powerful beneficial effects on health. A ripe, ready-to-eat avocado is slightly soft but should have no dark sunken spots or cracks. If the avocado has a slight neck, rather than being rounded on top, it may have ripened a bit more on the tree and have a richer flavor. A firmer, less mature fruit can be ripened at home and may be less likely to have bruises, depending on how it was handled during harvest and transport. Other varieties can have different textures (for example, smoother and less pebbly), different colors (for example, lighter or brighter greens), and varying degrees of glossiness. Use a stainless steel knife to cut the avocado in half lengthwise. Gently twist the two halves in opposite direction if you find the flesh clinging to the pit. Remove the pit, either with a spoon or by spearing with the tip of a knife. Next, take each of the avocado halves and slice lengthwise to produce four avocado quarters. The use of "nick and peel" method to peel the avocado. 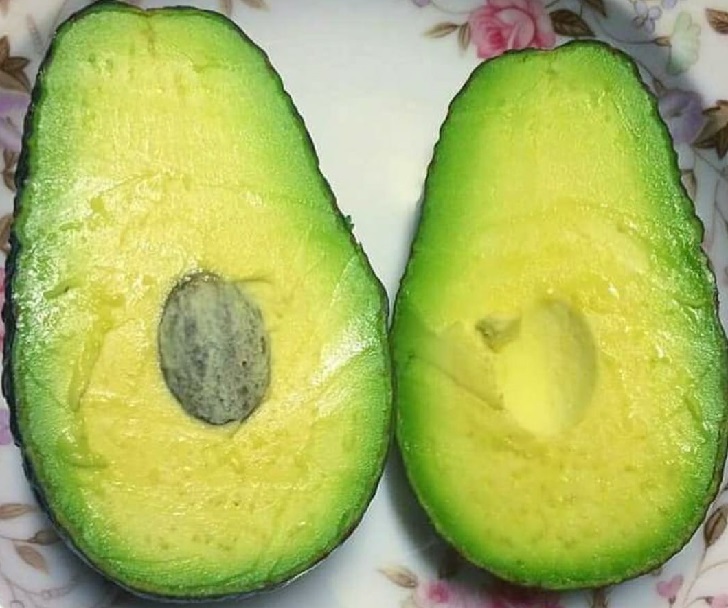 Just take your thumb and index finger to grip an edge of the avocado skin and peel it away from the flesh, in exactly the same way that you would peel a banana. The final result will be a peeled avocado that contains most of that dark green outermost flesh that is richest in carotenoid antioxidants. The method you use to peel an avocado might make a difference to your health. Research on avocado shows that the greatest phytonutrient concentrations occur in portions of the food that we do not typically eat, namely, the peel and the seed (or "pit.") The pulp of the avocado is actually much lower in phytonutrients than these other portions of the food. However, while lower in their overall phytonutrient richness, all portions of the pulp are not identical in their phytonutrient concentrations and the areas of the pulp that is closest to the peel are higher in certain phytonutrients than more interior portions of the pulp. For this reason, you don't want to slice into that outermost, dark green portion of the pulp any more than necessary when you are peeling an avocado. Accordingly, the best method is called the "nick and peel" method. In this method, you actually end up peeling the avocado with your hands in the same way that you would peel a banana. The first step in the nick-and-peel method is to cut into the avocado lengthwise, producing two long avocado halves that are still connected in the middle by the seed. Next, you take hold of both halves and twist them in opposite directions until they naturally separate. At this point, remove the seed and cut each of the halves lengthwise to produce long quartered sections of the avocado. You can use your thumb and index finger to grip the edge of the skin on each quarter and peel it off, just as you would do with a banana skin. The final result is a peeled avocado that contains most of that dark green outermost flesh, which provides you with the best possible phytonutrient richness from the pulp portion of the avocado. Here are health benefits of avocados, that are supported by scientific research. Avocados help to keep your eyes healthy. They contain carotenoids such as lutein and zeaxanthin, which help to protect your eyes against cataracts, eye diseases related to age, and macular degeneration. Those conditions are often caused by free radicals that accumulate in the tissues of the eyes. The antioxidant activity of those special carotenoids neutralize the effects of those dangerous free radicals. The health benefits of avocados include a healthier heart. Beta-sitosterol, which is found in avocados, helps to maintain healthy cholesterol levels. Research studies suggest that the intake of avocado may enhance antiatherogenic properties of HDL cholesterol, which helps in protecting your heart from atherosclerosis, also known as arteriosclerotic vascular disease. The significant levels of potassium also make avocados a powerful fruit in the fight against hypertension. Potassium is a vasodilator, which relaxes the tension of blood vessels and arteries, thereby reducing the chances of clotting, heart attacks, and strokes. Your diet plays a very important role in maintaining the balance of minerals and fluids in those who suffer from chronic kidney disorders. Potassium is one of the minerals that help in maintaining a normal heart rate. Avocados are a good source of potassium and their inclusion in your diet may provide other benefits as well. It is important to make sure that potassium levels are not too high as that can also be dangerous for the heart. Potassium is a key aspect of maintaining fluid balance through chemical channels for cells and organs. This balance of fluid is also vital for the functioning of the kidney, which handles the movement of fluid and toxins through the body. During pregnancy, morning sickness is very common. Avocados help to overcome nausea and queasiness during pregnancy since it contains vitamin B6, which is commonly connected to reducing nausea and vomiting. The anti-inflammatory properties of avocados are perhaps its most valuable attribute, and between the wide range of phytochemicals, flavonoids, carotenoids, phytosterols, fatty alcohols, and omega-3 fatty acids, avocados are one of the best foods for reducing the inflammation in tissues, joints, and muscles. Arthritis affects tens of millions of people around the world, and by consuming a proper amount of avocados, studies have frequently shown the symptoms and associated pain of arthritis can be efficiently reduced! Health benefits of avocados include a lower risk of cancers, including breast cancer and prostate cancer. Avocado contains carotenoids and monounsaturated fat, which both contribute to the significant reduction of cancer. Avocado also contains Glutathione, an antioxidant that protects the cells from cancer and the dangerous effects of free radicals. The list of antioxidant and anti-inflammatory compounds in avocados is impressive, and it is almost difficult to determine which one has the largest impact. Studies have been widely done on oral, skin, and prostate cancers, and the results show that instead of metastasizing, the organic compounds in avocados cause cancerous cells to undergo apoptosis (automatic cell death). Research is ongoing in terms of avocado and cancer. Avocado contains both vitamin C and E, which help to enhance antioxidant properties of the human body. Vitamin C recycles vitamin E and helps to reduce the oxidation of LDL cholesterol. Avocado also contains antioxidants like epicatechin, violaxanthin, neochrome, and about a dozen others. Antioxidants neutralize the effects of free radicals, which are the dangerous byproducts of cellular metabolism. They are responsible for dozens of serious conditions in the body, including cancer, cardiovascular disease, vision problems, premature aging, cognitive disorders, and many more. Avocados contain many vitamins and minerals that help in maintaining healthy skin. Carotenoids found in avocados are associated with reducing UV-induced inflammation of the skin due to exposure to sun. Oil made from avocado helps in protecting the skin against sunburn damage. The high levels of beta-carotene in avocados can be enzymatically split into provitamin A, which has long been connected to protecting the skin from a variety of conditions and the damaging effects of the sun. Regular exercise, along with a healthy diet, is very important in weight management. Avocados are fruits that provide nutritional value to the body and support weight control. Findings of a recent study suggest a number of beneficial effects of avocado on weight management. Consuming avocados is also associated with healthy aging. It contains compounds such as xanthophyll, which has antioxidant properties. Research studies suggest that an intake of xanthophyll may decrease signs of the aging process on various parts of your body. Avocados contain carotenoids such as zeaxanthin and lutein, which are associated with a reduced risk of cartilage defects (a symptom of osteoarthritis). Intake of foods such as avocado and soy may help in reducing the risk of osteoarthritis. Furthermore, the levels of essential minerals in avocados are significant, including zinc, phosphorous, copper, and trace amounts of calcium and selenium. All of these are connected to lowered risks of osteoporosis and improvements in bone mineral density. Avocados are best eaten along with other fruits and vegetables. This is due to the fact that nutrients present in fruits and vegetables get enhanced when eaten along with avocados. The absorption of carotenoid antioxidant molecules, which helps to protect the body against free radical damage, increases three to five times when a salad is eaten along with avocado. Therefore, adding sliced avocado to mixed salad is a good way to make a healthy meal even better. This makes avocado a great element as an appetizer since it prepares the digestive tract to function at its highest level during the meal to come! Apart from the fruit, the leaf extracts of avocados also provide health benefits. A study conducted on non-diabetic and diabetic rats suggest that the leaf extracts may help in lowering blood glucose levels. For diabetic patients, the metabolism of starch-based foods into simple sugars like glucose can cause the spikes and plunges that are so dangerous for diabetics. Fiber helps to slow the breakdown of food into usable sugars, so it is absorbed by the body in a more balanced way. Furthermore, the majority of carbohydrates in avocados are made up of 7-carbon sugars, a relatively rare form of sugar that actually inhibit the enzyme hexokinase. This helps avocados control the way that glucose is metabolized by the body, thereby protecting the overall health of diabetic patients. Athletes require a lot of energy and must maintain optimal nutrition to fuel their body. Avocado provides vital nutrients to athletes to maintain required energy levels and good health. Moreover, they contain phytochemicals that are a natural fuel source for your body. It is believed that avocados are soothing for the intestine and therefore aid in digestion. They contain soluble and insoluble fibers that help to keep the digestive system running smoothly. These two types of fiber are very important for digestion because they bulk up stools and help to ensure the smooth passage of food through the intestinal tract. Furthermore, they stimulate gastric and digestive juices so nutrients are absorbed in the most efficient and rapid way. Finally, they reduce the symptoms from conditions like constipation and diarrhea. All in all, the huge amount of fiber found in avocados (40% of daily requirement per serving) makes this a very important food for optimizing your digestive health. Consumption of avocados also helps in preventing bad breath, which is primarily caused due to indigestion or an upset stomach. Halitosis can be eliminated by improving digestive health, and the antibacterial and antioxidant flavonoids found in avocados also kill the bacteria in your mouth that can result in bad breath as well. Avocados have also been connected with preventing oral cancers! Avocados are packed with nutrients that are beneficial for maintaining healthy skin. It enriches skin that is dry, chapped or damaged. They are added to a variety of cosmetics due to their ability to nourish the skin with essential vitamins and make it glow. It is also used for nourishing dry and damaged hair. Many people use avocados to prepare skin and hair masks. Above all, avocado oil helps in treating plaque psoriasis. Beta-carotene and lycopene are two of the organic compounds found in large quantities within avocados. Both of these have been connected to improving the health and tone of your skin and eliminating signs of premature aging. Not only are avocados healthy, they’re also incredibly delicious and go with all sorts of foods. You can add them to salads and various sorts of recipes, or you can simply scoop them out with a spoon and eat them plain. They have a creamy, rich, fatty texture and blend well with various other ingredients. A notable mention is a guacamole, which is arguably the most famous use of avocados. It includes avocado along with ingredients like salt, garlic, lime and a few others depending on the recipe. An avocado often takes some time to ripen and it should feel slightly soft when ripe. The nutrients in avocado can oxidize soon after fleshing it, but if you add lemon juice then that shouldn’t happen as quickly.